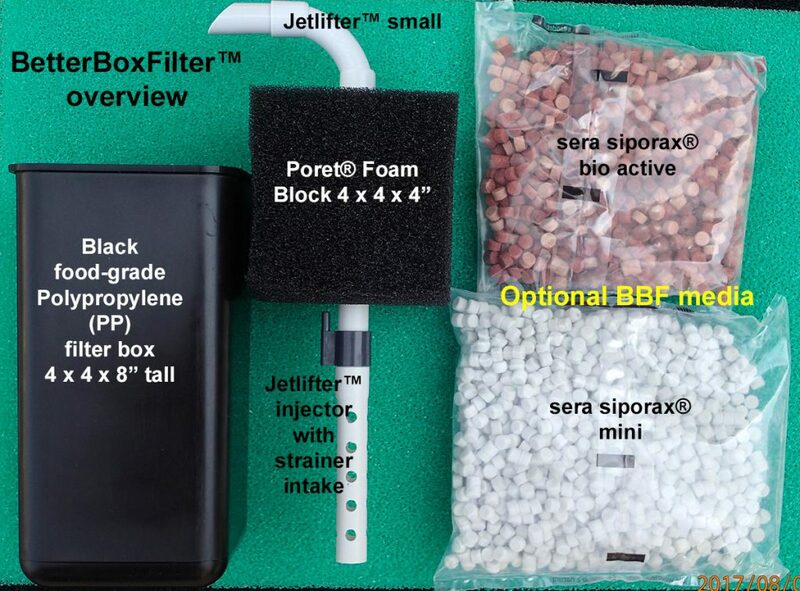 Launched in late 2017, the Swiss Tropicals BetterBoxFilter leverages their unique Jetlifter and Poret foam combination to create a new, simple, and flexible approach to the age-old box filter. At Swiss Tropicals, customers often asked about an option to use specialty media such as carbon, peat, various bio-media, or buffering stone in our filters. While Mattenfilter and Cornerfilter can accommodate various media behind the sheet in a media bag, the flow through them is not always optimal. We sought a better solution. So we went to work with our local supplier that makes our TBF filterbase in Minnesota to produce the BetterBoxFilter. We prefer the fewest parts possible, made with excellent quality. We developed an injection-molded black food-grade polypropylene (PP) box, combined with a custom-made Jetlifter, and our proven Poret foam. The resulting 3-piece BetterBoxFilter (BBF) has no moving parts and is air-driven. The BBF requires ~50 L/h of air to move ~200 L/h water. A look at the BetterBoxFilter. Water enters through the Poret foam at the top, traveling downward and through the filter body before being returned to the aquarium through the customer Jetlifter. 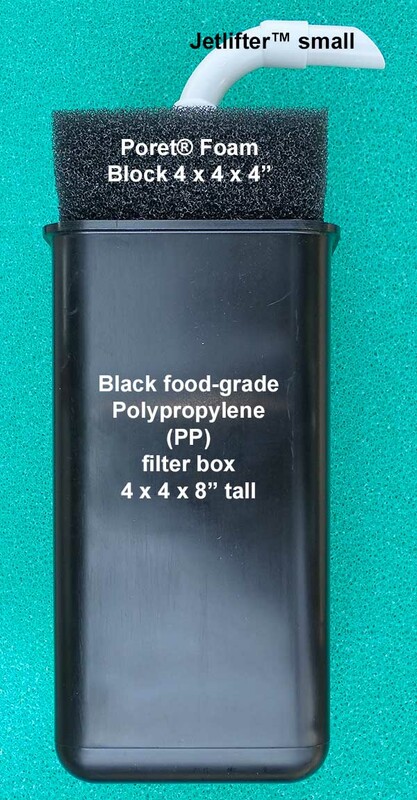 Most additional filtration media you can think of can be housed in the lower half of the filter, making this a tremendously flexible option as compared with the typical air-driven sponge filter. 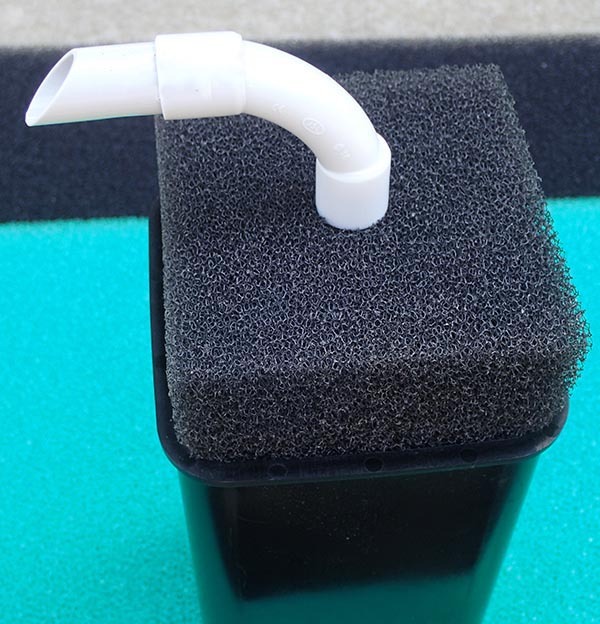 The BetterBoxFilter can be filled with various filter media, housed below the Poret foam, to suit different needs. It can be used in tanks from ~10-150 gal, depending on bioload and media type added. Essentially, the BBF is an efficient box filter, but it’s larger than the small clear plastic types on the market and is made with only long-lasting, high-quality parts. For smaller tanks up to ~30 gal, our BBF works as the sole filter. For larger tanks, it should be combined with other filters or used for a specific function, such as phosphate removal to curb an algae bloom. The main components (left & center) of the BetterBoxFilter by Swiss Tropicals, with examples of two different optional sera siporax medias shown at right.